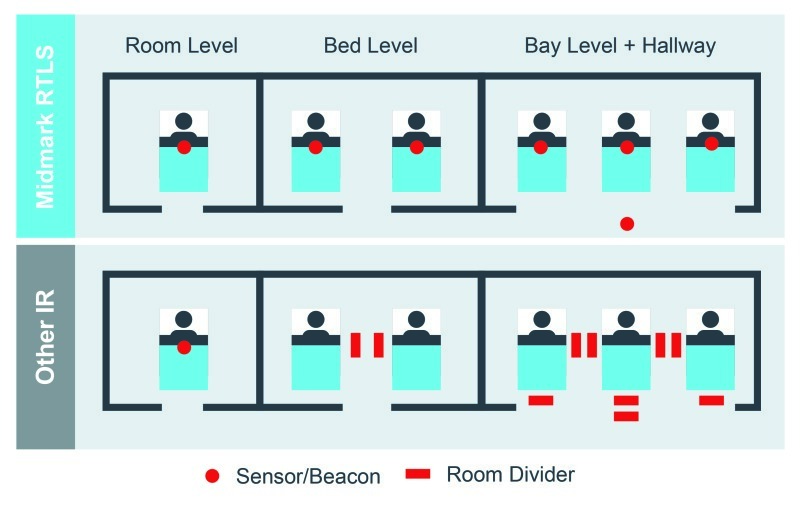 A recent article in DOTmed HealthCare Business News caught my eye with its comparison of ultrasound and infrared (IR) platforms as two options for using real-time locating systems (RTLS) to increase efficiencies within busy hospital environments. While the article rightly cites the drawbacks of excess hardware requirements for one of the IR platforms on the market, it fails to consider that there are two RTLS vendors who use infrared – and they use it in significantly different ways. Midmark RTLS, formerly Versus Technology, achieves bed-level and better granularity with one simple sensor in each location. As part of our original engineering team, I know the rationale behind our design. We created our platform, the first on the market to use infrared, to achieve locating granularity using discreet, aesthetically-pleasing sensors that capture IR signals emitted by badges and tags. It’s an elegant design that numerous competitors have attempted to engineer around to avoid patent infringements. The article, Ultrasound Versus IR: Making decisions about real-time location systems, compares ultrasound to one of those re-engineered IR systems, which operates the opposite way as the Midmark RTLS. Rather than sensors in the ceiling receiving IR signals, this vendor installs IR emitters that flood the room with IR, received by badges. This creates the cited need for multiple devices to achieve the room- and bed-level granularity. Specifically, the article looks at real-time locating in an open space or glass-walled area such as the ICU. While our competitor may require multiple devices to “create walls” or shape coverage in open areas, the same is not true for our solution. Midmark RTLS uses a simple focus ring within the sensor to shape coverage in open areas, without the need for additional technology or equipment. While the healthcare market has evolved in the last 30 years, so too have RTLS solutions. I applaud the innovations that have come to market to enhance patient-caregiver interactions. Yet, I hold steadfast to the integrity and aesthetic of the original Versus Technology design, now Midmark RTLS. When compared to ultrasound, you may need slightly more devices, yet our design is smaller, more discrete and overall less expensive in both total device cost and long-term total cost of ownership.